Non-Smoking. King bed in the master, queen bed in the second bedroom, queen in the third bedroom, and a full-size sofa sleeper. 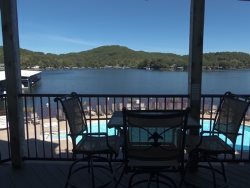 Includes full kitchen, washer/dryer, TV/VCR/DVD/Cable, stereo, also with a screened in lakeside balcony and an electric grill.